Click the button below to add the Black Home Surveillance Security Bullet Camera Kit 700TVL w/ Night Vision to your wish list. These outdoor CCTV cameras are equipped with 13 LEDs, which allow you to see in the dark up to 50ft away, even in pitch-black settings. 600 TV lines of resolution work to provide you with a full color and incredibly clear picture. The enhanced 3.6mm focal length allows for a wider field of view, which allows for larger area monitoring. The automatic night vision kicks in whenever it gets dark and turns off when it is bright to ensure 24/7 monitoring. Night Vision - See up to 50' away in the dark! Weather Proof - Built to beat 90% of weather conditions. Small - Small and discrete allows the camera to be easy to conceal! Reasonably priced and works fine. Great cameras and great price! This is the second four pack of Zmodo cameras I have purchased. I use them for general around the outside of the house surveillance, Great picture during day and good at nite in complete darkness. These are 3.6mm lenses and are great for seeing a wide area, if you want something that will read license plate numbers, this is not it. 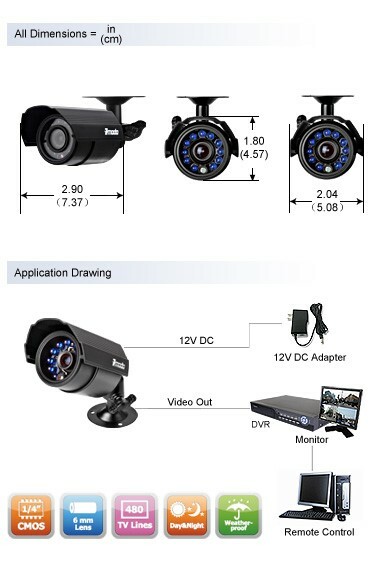 But if you are looking for a camera that will keep you aware of whats going on outside, these are it. I fully recommend Zmodo cameras, compared to the other Qsee and other commercial store brands.